Proclamation No. 247, issued by Malacañang in September 2002 and declaring the month of September of every year as Development Policy Research Month (DPRM), came at a most opportune time. It highlights the critical role of policy research in the socioeconomic advancement of the Philippines. The Proclamation underscores the “need for promoting, enhancing, instilling, and drawing awareness and appreciation of the importance and necessity of policy research” in development planning and policymaking. Thus, the observance of the DPRM is intended to cultivate a strong culture of research and use of data and evidence among the country’s national and local decisionmakers in policymaking and program planning. Through the different topics highlighted in every DPRM celebration, this event also aims to raise the public’s literacy of important socioeconomic issues. As the country’s leading think tank, the Philippine Institute for Development Studies (PIDS) was designated as the overall coordinator of all the programs and activities of the DPRM. Being at the forefront of policy research in the Philippines for nearly 40 years, PIDS has been engaged in the conduct of policy-oriented studies to assist policymakers and planners in crafting development policies, plans, and programs that are based on sound research evidence. PIDS has completed more than 800 studies that encompass a wide range of development topics. The Institute has made a significant contribution and influence on Philippine development policy through its active and close collaboration with government agencies, academic and research institutions, and international organizations. Its various research outputs are widely disseminated through its publications, conferences, seminars, and knowledge databases. The PIDS website is a comprehensive gateway to the Institute’s rich receptacle of socioeconomic studies, while the Socioeconomic Research Portal for the Philippines contains both PIDS and non-PIDS resources. 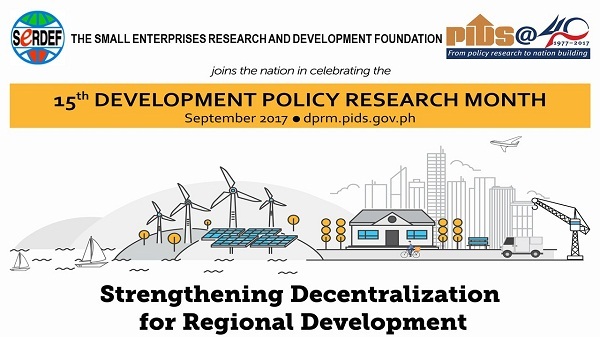 In the last 14 years, the celebration of the DPRM has focused on areas that PIDS considers as primary concerns and issues, thus are in need of utmost attention by policymakers. Other topics featured in the DPRM are emerging issues of the day, such as climate change which was the theme in 2009, a time when the effects of climate change were just beginning to be felt in the country. This year, the 15th DPRM theme, “Strengthening Decentralization for Regional Development (Pagpapatibay ng Desentralisasyon Tungo sa Kaunlarang Panrehiyon),” aims to promote a more inclusive and evidence-based discourse on decentralization issues and reforms, including the debates around federalism. It intends to emphasize the importance of policy research in the formulation of appropriate policy interventions to advance the development of regions.